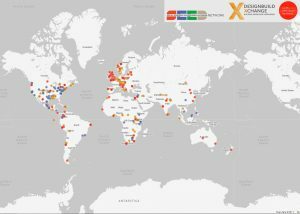 In collaboration with our partners, Design Build XChange (DBX) and the Social Economic Environmental Design Network (SEED), we have created a combined world map of the projects posted on our networks, called “Design for the Common Good”. Click on the map image below to visit the interactive map. You can navigate to more information about each project by clicking on its pin on the map. This takes you to the project entry on the relevant network website. You can therefore navigate between the different networks with ease.